Home / Opinion / Philippines / Scandal-Controversy / Liquid Ban on LRT and MRT is Stupid! MRT and LRT Stations in Metro Manila, Philippines is currently banning all forms of liquid in containers from entering the station. When they say liquid it includes perfume, mouthwash, lotion, and even your medicine. Yes, your medicine! I think this so-called LIQUID BAN on LRT and MRT is totally stupid! 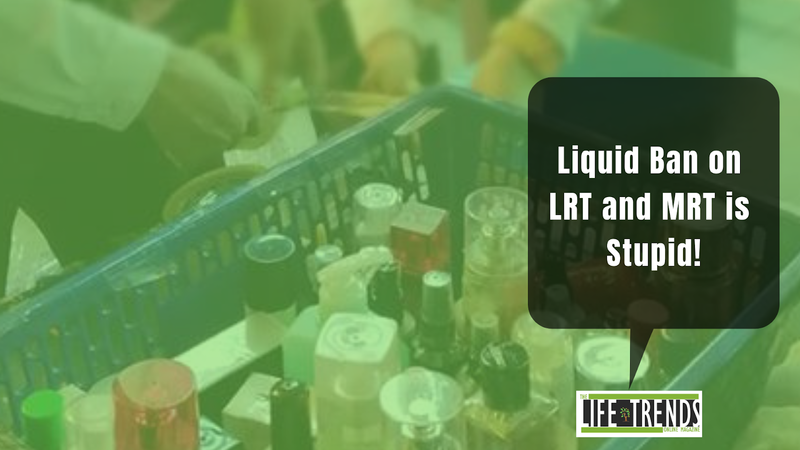 According to the LRT and MRT management, this is in response to a directive from the PNP that liquid of all forms should be banned. However, the PNP denied this and just said that these are just recommendations and not directives. The decision was made after the bombing in Mindanao. Perhaps they found out that a "liquid bomb" was used or some form of it. Why is the Liquid Ban Stupid? I am not saying that it is entirely stupid but come on confiscating everything even hand sanitizer, contact lens solution and even medicine is plain crazy. It is "BOBO". This security personnel should have some common sense not to confiscate essential things like medicine and contact lens solution in small amounts which are clearly impossible to be a bomb. People are usually bringing personal effects with them to remain presentable. Why not just follow the airport regulation where liquid 100ml and below will not be confiscated. How do you react to this nonsense? Here are some reactions via Twitter. One of the guard of lrt 1 (D jose) station said: " Starting tomorrow daw bawal na magdala ng liquid like bottled water,perfume or anything that include in liquid," what kind of policy is that @officialLRT1 ???? Smh! Do you know what the real problem is? Lack of serious security? The place that was bombed in Mindanao has a ton of security personnel but still, it got bombed.